Cheating in gambling houses refers to illegal activities performed by dishonest players who violate casino rules in order to trick the existing casino system and get own benefit. As a rule cheating is considered illegal but definite sanctions may vary across different jurisdictions, in which casinos function whether they are land-based or online. Particularly in Nevada state cheating is considered to be a serious crime that is punished by imposing certain punishments on wrongdoers. 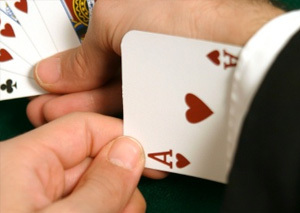 It is necessary to mention that advance playing techniques applied in times of gambling games are not considered illegal unless a gambler uses special electronic devices or something of the kind. For instance, card counting is not prohibited in some casinos but in Nevada casinos and other betting establishments are allowed to banish advantage players. It is always being said that "the house always wins" and it is true without regard to enormous movies and stories about beating the security system in Vegas casinos. Land casino history has seen a great number of cheaters and fraudsters during its lifetime. They tried to use various techniques and trick, deceive, swindle in every possible way. Cards marking in time of gambling sessions. Using digital devices or PC-alike aid in order to cheat the existing casino system. Fraudulent shuffling and cutting decks of cards while leaving some of them in a desired order. Top hat is a cheating option in roulette that involves fraud with chips after the ball was already landed. Late betting or past posting is making a bet after the allowed time. Set up previously marked own deck of cards into table gambling games. Hand mucking is a switching bad card with more desirable ones. The "skill" of casino cheating comes in different disguises from individual gamers to organized teams of gamblers. Thus, in some situation relations between casinos authorities and some players may be compared to an easy game of cat and mouse. Video cameras and other devices responsible for detecting fraudsters. Proper gaming process involves standardized procedures of shuffling, managing and storing cards. Operational software used by many Vegas casinos is produced by leading manufacturers and ensure top quality security and fair gambling. Some casinos educate personnel to reveal cheaters by reading emotions on their faces. Specialists of such kind are highly estimated in Nevada's gambling establishments. Honesty is the best policy in land-based Las Vegas casinos. Although some players are convinced that honesty and benefit lay not in one sack their gambling adventure is not very long as far as they become banned from betting houses or punished.